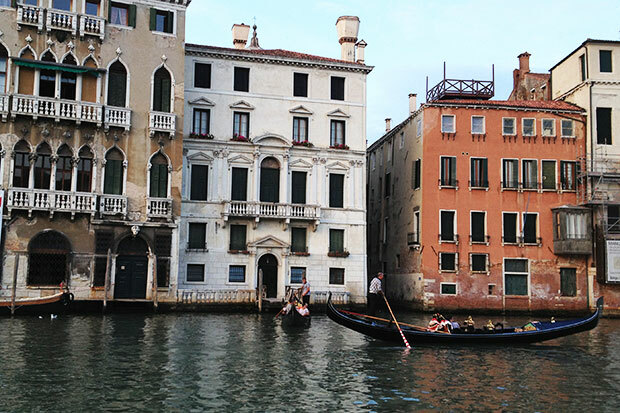 Venice is a city for art, food, love, and most of all tourism. The city is tiny. But it sees some of the heaviest tourist traffic in the world. Here are some of the less obvious, and more adventurous, activities to enjoy during your visit. Gondola rides are expensive. A cheaper and more thrilling option is to sign up for a kayak tour with Venice Kayak. You paddle. They take the pictures. You can ride under bridges, through secret passageways and to and from outside islands. Rick Steves offers free audio tours that can be uploaded to your phone or mp3 player. Play the files, which come with digital maps, while exploring the grand canal on a vaporetto or getting lost in the Duomo. Venice was the home of great composers like Vivaldi, Wagner, Monteverdi, and Gabrieli. See a masterwork of music and drama in Venice’s most important opera house. The Venice Biennale is a sort of olympics for visual art. Countries around the world send their best artists to showcase works in national pavilions. Some countries use permanent national pavilions, which were constructed in the early 20th century. Others rent out store fronts or vacant palaces to create a temporary space. Venice is shaped like a fish. Visitors crowd the head of the fish and the population density can be overwhelming. Wander toward the tail until you find yourself in a local neighborhood restaurant. Getting lost is part of the fun. The adventurous traveler seeks experiences beyond the traditional traveler’s program. From rock climbing to sky diving, we search out active adventures in fun cities to visit. Let us know what you think! Connect with us on Facebook, Twitter, or Google +.